Paint a standard lightbulb white and let dry. Add a face with pink paint, and then more facial features with black and white paint. 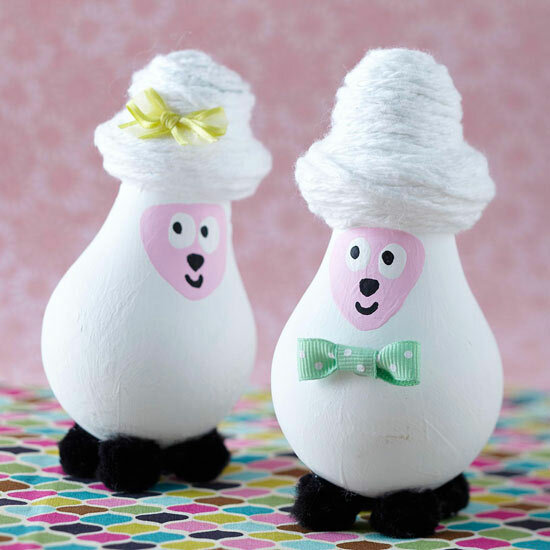 Wrap the metal screw top with white yarn to give the sheep a hat, then glue on black pom-poms for the feet and finish with a bow. Let kids decorate their lambs with other crafty embellishments, such as glitter or paint, if desired. How ridiculously precious are these things?…We can’t even stand it! They’re similar to the time-tested painting of eggs, but you need that lightbulb shape to wrap the “hat.” So we think you might even be able to use a good, ripe pear here too! Let us suggest that you and the kids name and sign your lambs in ink on the bottom and keep them safe somewhere. Pull them out for the next generation, a long time from now. They may not even know what a “lightbulb” is. « Is There Anything 3D Printing Can’t Do?